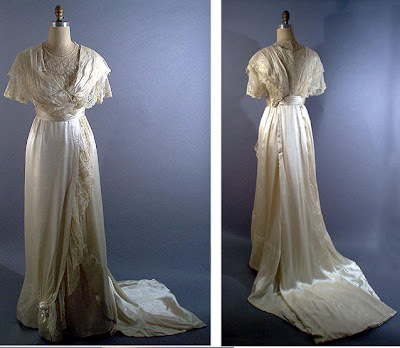 Past Perfect Vintage: Vintage Wedding Dresses Wanted! The Victoria and Albert Museum in London, home to a fabulous costume collection, has a brand new and marvelous Web Project. And they have asked us to help! In the tiny, lonely niche of vintage fashion blogging, this is Big Time. 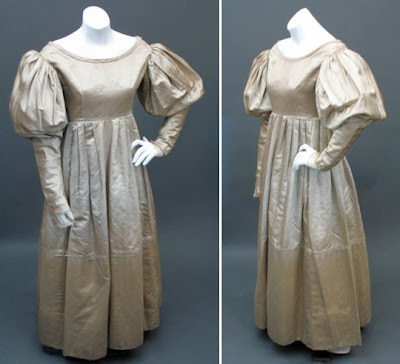 They have just opened a website on wedding fashion where people can upload wedding photographs from 1840 to the present. The address you impatiently ask? My delightful contact Gail tell me they "hope to create a very large database of wedding fashions organised by date. People can upload up to three photographs from any wedding or wedding dress". That's my emphasis. You don't have to have a photo of the original bride in the dress. The criteria? It is a museum after all. They need information. "The only stipulation is that the item or photograph should come from a known wedding. The couple need to be named and the date of the wedding should be included. This will allow us to create a historical record." Now there will also be additional optional information such as location, designer Yes!, maker Yes again! of the gown, and religion of cremony. And they want handmade dresses! They are very early in this project, so vintage afficionados, it's time to kick in. I have a couple photos waiting at the scanner. I'll see yours at the V and A. Exciting! I work in historical costuming,so I'll be excited to see the results . . . .